Annals of Insurance: The Battered Need Not Apply? I’m guessing that you never thought of domestic violence as a pre-existing condition. Well, you haven’t tried to file a claim in one of the seven states that permit health insurers to deny coverage for the battered. The seven are Idaho, Mississippi, North Dakota, Oklahoma, South Carolina, South Dakota and Wyoming, plus the District of Columbia. The aptly named Ryan Grim at the Huffington Post has developed a thorough chronology on this bone rattling demonstration of insurance logic. This is simply one example among many that when it comes to determining what qualifies for coverage, private insurers should definitely not be left on their own. The phantom “death panels” be damned: we already have health care rationing and premature deaths due to carrier rescissions of coverage, routine denials of (expensive) treatment, and exorbitant tier 4 drug charges. To be sure, there is a logic at work in the insurance thinking: “We do not have to cover pre-existing conditions. You were beaten up before coverage began. You were beaten after coverage went into effect. Therefore, we deny your claim.” I wonder if the subsequent beating involves a new beater, does that create a new – as opposed to pre-existing – condition? Using the same logic, if I fell down and broke my arm prior to my current coverage and broke the same arm again in another fall, would that be a pre-existing condition? State Farm no longer rates or denies life or health insurance to battered women, even if there’s a history of domestic violence. We realized our position was based on gut feelings, not hard numbers. And we became aware that we were part of the reason a woman and her children might not leave an abuser. They were afraid they’d lose their insurance. And we wanted no part of that. It’s great that State Farm changed the policy, but you have to wonder how their “gut feelings” led them to deny coverage in the first place. Victims of domestic violence need prompt medical treatment, counseling (yes, adjusters, pay for the counseling!) and a little chat with the police. One would hope that insurance companies would figure this out for themselves. They don’t really need new state and federal laws compelling them to do the right thing, do they? Fernando Martinez worked for the D. H. Smith Company, as did his two sons. The company provided Martinez and his sons a Ford F350 flatbed to drive to and from work. Because Martinez did not have a driver’s license, only the sons were to operate the vehicle. In June 2007, Martinez and his sons were on their way to a construction site, with the elder Martinez behind the wheel. Martinez rear-ended another vehicle on the freeway, injuring himself and his son. At first, Fernando and his son lied to the investigating officer from the Califomia Highway Patrol about who was driving the company truck. However, marks on their bodies from their seatbelts showed that Fernando was driving and his son was a passenger at the time of the collision. They eventually fessed up to the fact that Fernando was driving. Both filed workers comp claims. There is no doubt that the son’s injuries are compensable. But what about Fernando? After consideration of all of the evidence, testimony at trial and in deposition, and the demeanor of witnesses, it was found that applicant’s conduct in driving the company truck to work without a driver’s license, against the express orders of the employer, was a cause of the injury, and takes the activity in which the injury occurred outside the course of employment. The conduct of driving the company truck on public highways against the express order of the company was more than the manner of performing duties. It was different duties than he was employed for. It appears that applicant did drive the truck before his sons were licensed, contrary to the testimony of defendants. However, on the evidence it is clear that he was not allowed to drive after they were licensed, and he and his sons were well aware of that…Applicant’s conduct in this case posed an increased hazard to his own safety and life, to that of his son and members of the public, and greatly increased the risk of liability to the employer for damage to property and injury. Sounds reasonable, but remember, this is California. The review board overturned this decision. They found the injuries to Fernando were compensable, as he was in the course and scope of employment and furthering the interests of the employer, even though he was disregarding the employer’s instructions pertaining to his driving. With precedents like these, it would be hard to come up with a case where employee misconduct resulting in an injury was not compensable. In California at least, virtually anything you do at work is compensable. In this case, it does not matter that applicant may not have been authorized by defendant to drive the truck because his travel to the job site in the truck was authorized by the employer and was of benefit to the employer. A distinction must be made between an unauthorized departure from the course of employment and the performance of a duty in an unauthorized manner. Injury occurring during the course of the former conduct is not compensable. The latter conduct … does not take the employee outside the course of his employment. It is apparently not a concern to the review board that the “unauthorized manner” in this particular case involves an illegal activity (driving without a license). The End of “To and Fro”? NOTE to CA employers: you may want to bag it on the company cars. Workers comp costs in California are the highest in the country, despite the fact that employee benefits are relatively stingy. The high costs derive from many factors, one of which is revealed in this particular case. There are embedded in case law deeply rooted concepts that tilt the interpretation of compensability in the direction of injured employees. In many states, defense could certainly raise the issue of whether Fernando’s insistence on driving the truck without a license crossed the line into “serious and wilful misconduct.” You know, the concept of personal responsibility. That might be a reasonable argument in some states, but it doesn’t hold any water in California. For another biweekly issue of the best of the health policy blogs, Brady Augustine hosts The Boys (and Girls) of October edition of Health Wonk Review at medicaidfirstaid. Get a little baseball nostalgia with your health policy. For our neighbors in the Boston area, Brady recalls the era of Carlton Fisk, Carl Yastrzemski, Fred Lynn, Jim Rice, and Luis Tiant. ADA, RTW and the law – Failure to accommodate an injured worker as they return to the workplace can be costly. Sears is setting a $6.2 million bias case over just such an issue. Sears refused to reinstate a recovering injured worker with reasonable accommodations when he sought to return to work, and subsequently fired him. An investigation turned up more than 100 other employees who sought return to work with an accommodation, but were fired by the company. New Mexico – “Thirty-three states, including neighboring Colorado and Arizona, already require workers’ compensation for farm workers, although some limit coverage or exempt small farms. But New Mexico’s agricultural workers fall into a job category not protected under state law.” New Mexico agricultural laborers sue for workers’ comp coverage. Presenteeism – Is presenteeism worse than absenteeism? Roberto Ceniceros looks at new research on the issue at CompTime. H1N1 Virus – Jon Gelman makes the case for the urgent need for workers compensation pandemic planning, noting that in the case of emergency, the Federal government has sweeping powers under the Public Health Service Act (PHS) that could disrupt employment throughout the country. He cites a recent Harvard School of Public Health study reveals that 80% of businesses foresee severe problems in maintaining operations if there is an outbreak, and looks at what this might mean to workers comp. Flu.gov has issued Guidance for Businesses and Employers for the Fall Flu Season. 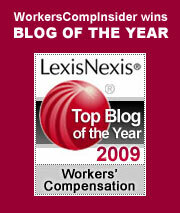 Consumer resources are available at the Consumer Insurance Blog.